Located just minutes away from the 57, 60, 71, 10, and 210 freeways, Diamond Bar Golf Course is a convenient distance from a number of Southern California communities, including Los Angeles Country, Orange County, and the Inland Empire. Designed by prolific course architect William F. Bell, Diamond Bar’s three tees have provided golfers with a superior experience since 1963, earning the title of “Best Municipal Course” from Golf Digest. Diamond Bar Golf Course was recently honored with the Los Angeles County Course of the Year Award for 2012. Enjoy the scenery from the expansive banquet hall’s elegant floor-to-ceiling windows, which overlook the 6,801-yard championship course and the exquisite mountain backdrop. Whatever you’re searching for from your golfing experience, you’ll find it all at Diamond Bar Golf Course. Players Club Members get 2 domestic beers for $6 when they tee off between 10am and 5pm on Fridays. Join our team from the Lion Golf Academy every Saturday as they help you with your game in 2019. 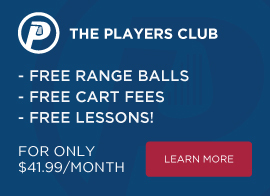 Players Club Members are LIMITED to only participating in TWO (2) Clinics per calendar month. Members who bring kids after 2 pm on Sunday will recieve a complimentary small bucket of range ball for each child while they hit their large basket. Kids must be over 3 years old and under 12 years old. 04/17/19 The Range is closed until 11. The Diamond Bar Practice Range will be closed until 11:00AM every FIRST and THIRD Wednesday of each month for rountine maintenance. From tournaments and weddings to corporate meetings, fundraisers and holiday parties, we’ll go the extra mile to deliver a great experience.